Oops - we don't appear to have a video for the NetScan 4000. Network accessible scanning achieves two major goals for your document workflow and capture: scanners can be easily and convenient located in common areas without a PC connected and the scanner can access broad network connections to file servers, email servers, FTP locations and network printers and fax servers. Direct connect scanners are a vital part of your document capture strategy but now network scanners can meet your shared scanner needs with great efficiency and ease of use. The NetScan 4000 can easily support small to medium workgroups and offices through secure multi-user access and easy administration through an embedded form-based web page configuration and a standard Ethernet connection. So you don’t need an expensive IT department or network contractor to begin scanning documents to local servers, FTP location, convenient email delivery anywhere on the internet or simple fax sending and receiving through standard phone line. The scan-to-email feature lets you scan paper-based documents in full color and e-mail them in PDF, JPEG, or TIFF file formats directly from the NetScan 4000. As a result, you can send the scanned document simultaneously to a lot of multiple addresses or distribution lists. The NetScan 4000 supports LDAP (lightweight directory access protocol) for direct access to Microsoft Exchange Server email directories. Plus, there are a total of 2,000 custom e-mail addresses which can be added to the device. When the NetScan 4000 is directly connected to a PCL-enabled inkjet or laser printer through its USB connection, the configuration turns into a powerful digital copier. Through the easy-to-use font panel, you can make black and white copies just like you do on a regular copy machine. With an Auto Document Feeder (ADF), the NetScan 4000 allows a stack of 50-page document(s) to be continuously scanned and transmitted at one time in reliable quality to increase your efficiency. 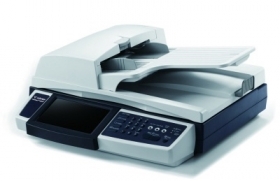 When the NetScan 4000 is connected to a supported printer and a telephone line, this configuration can be used as a send/receive fax machine that prints incoming faxes. Add to this a phonebook speed dial, and broadcast fax directory to send faxes to large groups to increase your efficiency. There is a full numeric keypad to enter fax phone numbers as simply as using your traditional fax machine.